IT Blog Awards 2010: Individual IT Professional Female - category information. This category is for blogs that detail an individual perspective, not a company line, of life in the IT industry. 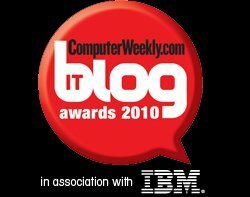 Any female blogger working in IT below director level is eligible for this award. Get your badge now. Emma explains Microsoft licencing in depth! quality="high" bgcolor="#ffffff" width="120" height="220" name="cw_badge10_IT_pro_female" align="middle"